Darryl is a spiritually gifted artist, rendering portraits of the soul. 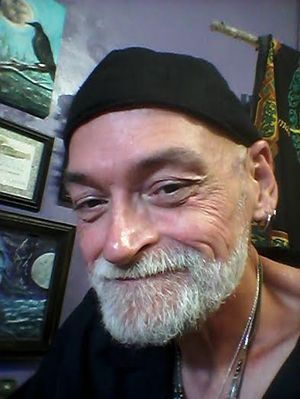 He is a Tarot & Soul Card reader and a gifted medium working with his clients and their ancestors to bridge the past and future. Palmistry and Past Life Readings are among his talents. As a featured artist, you can find Darryl, throughout the day, creating one of a kind interpretations of spirit for which he is well-known for throughout Central Florida and surrounding areas. We are proud to have him work among us. A teacher of the ancient ways of Druidry, Darryl is available for one on one classes. To schedule an appointment for a personalized session, or to enroll in his classes, please call The Raven Faerie at 863-940-2086.